If you love Greek salads, this one’s for you! All the best Mediterranean flavors, light but hearty and a total crowd pleaser! We’ve been making this salad all summer and literally can’t stop eating it! 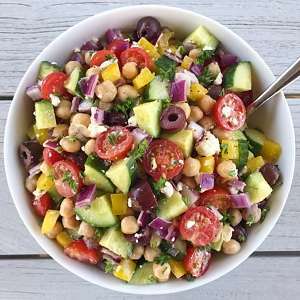 The details… Chickpeas, cucumber, yellow pepper, cherry tomatoes, kalamata olives, creamy feta and fresh chopped parsley all tossed in the yummiest Lemony Vinaigrette. Simple and delish! Super easy to make, it makes a large quantity so perfect for a party or meal prep. And it’s hearty so it stays fresh for several days — there’s nothing to wilt. The perfect Spring and Summer salad! Light but hearty, flavorful and perfect for any occasion -- light lunch, bbq or brunch. Makes a large quantity and stays fresh for days -- there's nothing to wilt. Place all ingredients except parsley in a large bowl. Pour dressing over salad to taste and toss to combine. Stir in parsley and serve. What are the macros and cals per serving? Hi. Good question. Unfortunately at this time I don’t offer that information on my recipes. Oh my gosh, so much YUM!! And talk about flavor!! This recipe was so simple and inexpensive to create. Everyone really enjoyed it and the left overs keep nicely! No wilty veggies. The dressing is light and flavorful, just the way I like it! I will make this again and again!! So glad you love it as much as we do! And no wilty veggies make it great for summer or meal prepping! This was easy and amazing! My kid loved it too. Thank you for sharing. I’ve made this recipe 3 times now. It is delicious! I’ve used the dressing in other recipes as well. Thank you! Yay! So glad you love it! The dressing is great– love you use it in other recipes!